Experience tells us that a “mainstream exit” – a traditional merger or acquisition – is hard to come by for a social venture, and even more so, for a BoP social venture. It’s exponentially harder to get a model to scale in these, the most difficult of markets, with disaggregated producers and consumers, with poor infrastructure and spotty last mile reach. Assuming you overcome these barriers and you are making your model work, then there’s that pesky little issue of how to value a venture when few comparables exist, when adding impact to the equation adds more nuance but not clarity to the valuation process, and valuation based on cash flows alone seems inadequate. All these factors contribute to the elephant in the room: the unspoken understanding that conventional exits are hard to come by for the BoP-focused company. This week atyati technologies, a leading technology platform provider for the rural banking sector in India, with 2.5 million end users, is challenging this conventional wisdom in a big way. 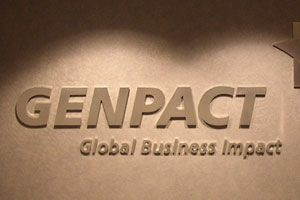 On May 14, Genpact, a $1.9 billion global leader in business process and technology management, announced its acquisition of atyati. The acquisition provides Genpact with a leading technology platform in the rural banking space with last mile functionality, allowing Indian banks to serve millions of unbanked in rural India. India’s unbanked population is still a staggering 61 percent in rural areas, according to the Reserve Bank of India. The acquisition marks one of a handful of instances where a BoP-focused private initiative has been acquired in a mainstream transaction. As is the case with most private acquisitions, the details of the deal are not disclosed. What is clear is that this is an operational and strategic move for both parties. Is the BoP’s Future In the Cloud? What sets apart atyati from the countless other mobile, rural, biometrics-enhanced banking solutions for the poor? It’s all in the cloud. Atyati hosts the solution on a private cloud so that banks reap the benefits of a completely outsourced service that is charged on a pay-per-transaction or pay-per-village model. The parallels to be drawn to an earlier telecom platform based revolution are unmistakable. In markets where margins are thin and volumes are hard to come by, success requires that you have a little something extra. Historically, when that something extra is a platform, on which to innovate, build economies of scale and add value, BoP models thrive. Think of the BoP innovation that happened on the coat-tails of the telecom revolution, when a platform of cell towers and fiber optic connections made mobile banking, telemedicine, and mobile heath interventions possible and profitable. It will be interesting to watch where cloud computing carries the BoP movement. Is the Genpact acquisition of atyati’s cloud based competencies a one-off, or a sign of things to come? Is cloud computing THE new platform, capable of adding value to strong BoP initiatives in ways that are so radical that BoP companies begin to benefit from mainstream funding and exit strategies? Let us know what you think.